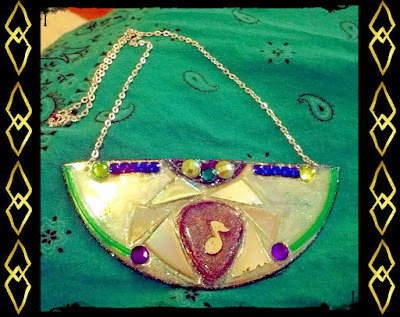 I cut a CD in half and referenced a Recycled CD Necklace I saw on Pinterest. I made a simple mosaic on it using Egyptian collar necklaces as my inspiration. I like to think of this piece as Lisa Frank meets a musical Egypt. Necklace features blue, green, purple and yellow gems, a guitar pick pendant and iridescent CD pieces. All of this was permanently glued on with several layers of Mod Podge. Edges are sanded and backside is painted with gorgeous glitter.